Beckwith, John. "Chamber Music Performance". The Canadian Encyclopedia, 04 March 2015, Historica Canada. https://www.thecanadianencyclopedia.ca/en/article/chamber-music-performance-emc. Accessed 24 April 2019. 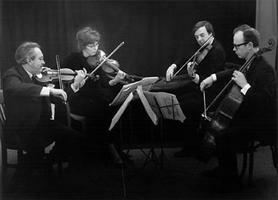 The Amati Quartet (University of Saskatchewan), 1969. Murray Adaskin,\r\nNorma Lee Bisha, Robert Klose, Edward Bisha (courtesy University of Saskatchewan Archives, A-4659). Chamber music performance. Early evidence of the cultivation of classical chamber music in Canada, mainly by amateur performers, both as an edifying leisure activity and in public concerts, dates from the period 1790-1820. In Quebec City Jonathan Sewell, Frederick Glackemeyer, and others participated in readings of then-new quartets and quintets by Haydn and Mozart in the 1790s. A collection of bound volumes of parts, some previously belonging to the Desbarats and Sheppard families and now housed in the Laval University Library, suggests that domestic music-making in the early 19th century included orchestral works in small-ensemble arrangements: one title, 'Haydn's grand [ie, the 12 'London'] symphonies... arranged for five instruments, viz: two violins, a german flute, a tenor and a violoncello: with an accompaniment for the piano forte ad libitum..'. for example, covers separate volumes for 'tenor' (ie, viola), cello, and piano, all inscribed 'Ex Libris Miss Desbarats'. Scores and parts of piano trios and string quartets by Ignace Pleyel belong to the same collection. In Halifax public performances of chamber works by Pleyel, Haydn, and the fashionable composers Vanhall and Avison are known to have taken place before 1800. By the mid-19th century, there were regular and more widespread attempts to organize such activities into public concert series (see Concerts), often centred around one dynamic personality: examples are Griebel in Toronto, Jehin-Prume in Montreal, and Dessane in Quebec City. The formation of conservatories further fostered ensemble performance: the 1887-8 calendar of the TCM (RCMT) promised that students 'will be formed into classes for ensemble playing... and enabled to study chamber music for piano, string and other instruments'. The most exacting ensemble medium, the string quartet, is also the one which has continued to attract the largest number of groups, perhaps because of the challenge of its refinements and the evidently inexhaustible richness of its repertoire - a repertoire to which Canadian composers have added significantly from the early 20th century on. The Griebel Quartet (Toronto, mid-1850s), Ottawa String Quartette Club ('short-lived' from 1886), Conservatory String Quartette (Toronto, intermittently 1889-ca 1905), Dubois String Quartet (Montreal, 1910-38), Gilbert Quartet (Quebec City, 1911-27), Heins Quartet (Ottawa, 1914-27), and Academy Quartet (Toronto, 1914-24) were among the notable pioneers. The last-named was an immediate precursor to 'the first [Canadian] ensemble dedicated exclusively to chamber music' (Elliott, p 20), namely the Hart House String Quartet, 1924-46, whose other firsts included extensive tours both in Canada and abroad, and broadcasts and recordings (from the mid-1920s). The de Ridder and de Rimanoczy quartets in Vancouver, the Tudor Quartet in Winnipeg, and the Parlow, Dembeck, and Solway quartets in Toronto, were active in both concerts and broadcasts in the period 1930-60. The Solway group made a specialty of pop- and folk-music arrangements in their many school concerts, paralleling the 'popular quartet concert' tradition of several late-19th and early-20th century ensembles. Similarly the emphasis on new works by the Montreal String Quartet (1955-ca 1963) recalled the Academy Quartet's efforts to introduce modern repertoire in the World War I period. The first quartet-in-residence at a Canadian university was the Canadian String Quartet at the University of Toronto, 1961-3. In succeeding decades virtually all leading ensembles assumed this role, among them the Amati (University of Saskatchewan), Brunswick (University of New Brunswick), Czech (McMaster University), Lafayette (University of Victoria), Laval (Laval University), Orford (University of Toronto), Purcell (Simon Fraser University), University of Alberta (University of Alberta), and Vághy (Queen's University) quartets. On the demise of two of the most successful in 1991 - the Orford and the Purcell - the critic Robert Everett-Green remarked that for the future, given the increased financial hazards of touring and the uncertainties of the recording industry, such affiliations would likely remain a mainstay of support. Among newer string quartets gaining prominence in the 1980s and early 1990s were the Accordes (Toronto), Atlantic (Halifax), Morency (Montreal), Quebec (Quebec City), and St Lawrence (Toronto) quartets. The triennial Banff International String Quartet Competitions (from 1983) have drawn unusually wide attention. The Hambourg Trio was an early-20th century professional group in Toronto devoted to piano-trio literature. Begun by three of the four Hambourg brothers, it continued for over 30 years from 1915; through many changes, the player with the longest membership was the cellist Boris Hambourg. Another prominent Canadian piano trio - called in fact the Canadian Trio (1928-39) - was that of the Nelson sisters of Winnipeg, active 1928-39. The group's cellist, Zara Nelsova, later performed in a second Canadian Trio (1941-3) in Toronto. The Brandon University, Hidy, and Rolston trios, One Third Ninth, Trio de Montréal, and Trio Victoria are noteworthy among still later groups. The 1970s witnessed an increased emphasis on less-standard chamber-music groupings. Two woodwind quintets - the Quebec Woodwind Quintet and the York Winds - achieved international prominence, as did the Lyric Arts Trio, and three ensembles still vigorously active in 1991: Canadian Brass, the Gerald Danovitch Saxophone Quartet, and the Canadian Electronic Ensemble (the last consisting of a trio of live-electroacoustic performers, occasionally doubling on various wind and keyboard instruments). Newer groups from the late 1980s are Amici (clarinet, cello, and piano, with various occasional guests), in residence at the University of Toronto from 1989, and the Atlantic Trio of St John's, Nfld (soprano, clarinet, and piano). The appeal of chamber music to amateur performers - a powerful reason for its early cultivation - has persisted. Such activity is difficult to document, being pursued largely for the social and musical gratification of the participants, their friends, and families, rather than for public attention. Moreover despite the Canadian love of organizing national associations to correlate and lobby for special interests, there is no such unifying body for the country's chamber-music players, whether professional or amateur (although amateur chamber music performance has been supported by CAMMAC and by local groups, eg, the Home Music Club of Toronto, founded in 1897 and still active in 1990). A quartet of medical practitioners, a family piano quartet, a woodwind ensemble of school teachers, may typify the many groups which meet regularly, and, while their readings seldom reach beyond a small circle, their keen appreciation and sometimes considerable expertise are important to the cultural vitality of their region. One example of an informal low-profile chamber group is the Padberg Trio, active 1930-40 in Trail, BC. Comprising two violins and a piano, occasionally adding a soprano or a cello, the ensemble met weekly to play 'classics such as Bach & Vivaldi concerti, Sonatas of Handel, Vivaldi, Paganini, Mozart, piano trios with 'cello parts re-arranged for a violin,... musical comedy selections & such things as the Kreisler violin numbers, bits of operatic scores, Brahms' Hungarian Dances, Bizet's L'Arlésienne Suite, etc...,' eventually being featured in programs of the Trail Women's Musical Club, at 'banquets and civic occasions,' and in local and provincial-network radio broadcasts. Music was sometimes arranged by the leader, Theodore Padberg. As one member later recalled, 'We just got together & played for fun' (History of Music in British Columbia, p 223-4).